My husband’s summer favorite drink!! Whether kids or elders, mangoes are loved by all. Mango Shake or Smoothie being very common in every household varies with just one or two Ingredients. Often smoothies are made with just milk, added yogurt or ice cream. I love my Smoothie with spoonfuls of fresh cream blended giving it a rich texture!! Try out my recipe, do share your in the comments below!! Peel the mangoes, cut the flesh and remove the seed. Chop roughly. Take a blender jar, add in the chopped mangoes and sugar. *Add Sugar free in case you wish. #Sugarfreenatura *In case your mangoes are sweet enough, you can avoid adding extra sugar or sugar free. Blend for 30 seconds. Now add in 1 glass of milk and blend for another 30 seconds. Now add in the remaining milk and fresh cream. Blend for another 30 minutes. * You can also add ice if you wish. 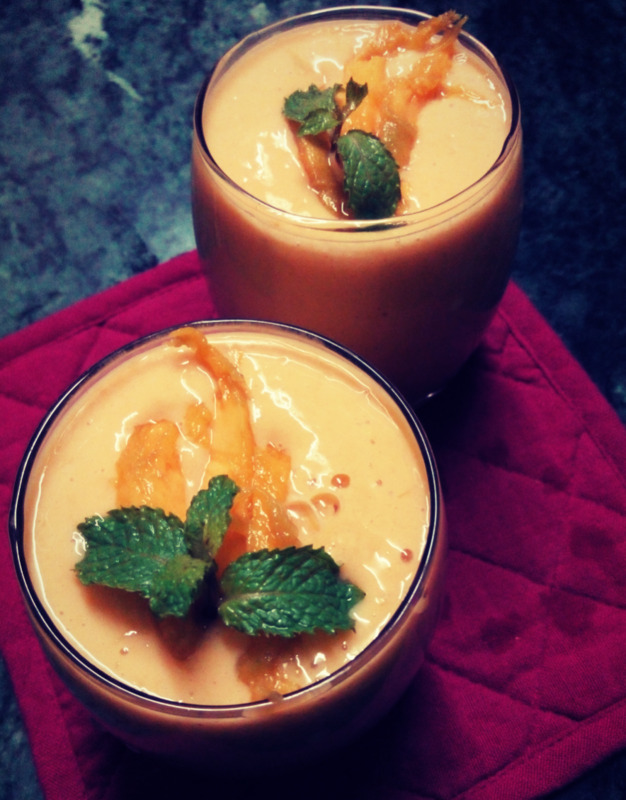 Now take your favorite Smoothie glass and pour the Mango Smoothie. Garnish with Mango wedges and fresh mint. Serve chilled.